When hiring a personal injury attorney, board certification matters. Board Certification Matters. Here’s Why. Watch the following video as Pensacola Civil Trial Lawyer and personal injury attorney Joe Zarzaur of Zarzaur Law, P.A. goes through the steps of becoming a board certified civil trial lawyer in Florida. Mr. Zarzaur is Board Certified in Civil Trial Law and has record jury verdicts in both Escambia and Santa Rosa County in injury cases. He obtained a 9.3 million dollar verdict from an Escambia County jury and has a 2.5 million dollar verdict from a Santa Rosa County jury. These were both injury cases that did not involve death. Only 1% of lawyers in Florida are Board Certified in their area of specialty and it is the highest measure of competency permitted by the Supreme Court of Florida. Mr. Zarzaur earned the certification as a Civil Trail Lawyer (also known as a civil trial specialist) from the Florida Bar and the National Board of Trial Advocacy. Zarzaur Law does not take a “volume” of cases but selects those cases where the firm can take a substantial personal business interest in the client and the case. Many larger firms are in the “volume” business and are pushing clients through like a factory. That will never be the case at Zarzaur Law. Joe only handles those cases that have serious personal injuries and he turns away those cases that do not involve such injuries. This keeps the firm focused on a select quality of injury and death cases. 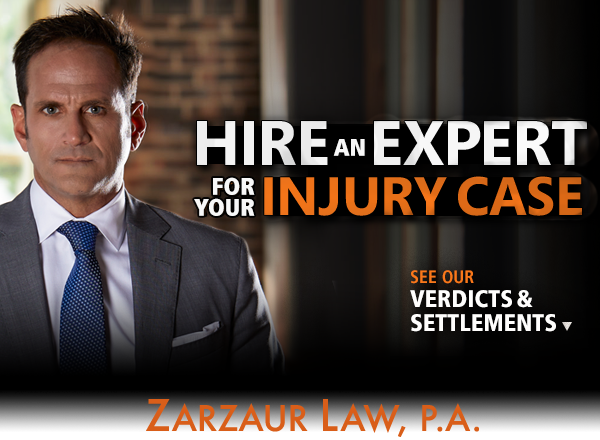 If you or a loved one, a business associate or friend has been injured due to someone else’s negligence, contact Zarzaur Law today. Call for a free case evaluation at (855) 447-3563 or click here to request a FREE case review.